These are some of the sweetest treats I’ve made, and possibly ever eaten. The recipe is from Peter Reinhart’s The Bread Baker’s Apprentice and can be found here, among other places. 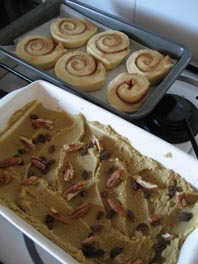 The recipe was last month’s Daring Bakers task. The Daring Bakers are a group of baking bloggers who all take on the same recipe challenge each month, with the results posted when the challenge is complete. 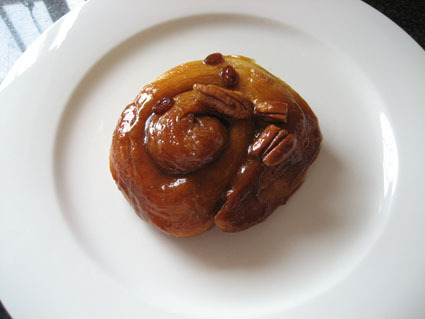 There are two options for your buns – to top them with raisins, pecans and caramel to make sticky buns or to drizzle icing over the buns for cinnamon buns. 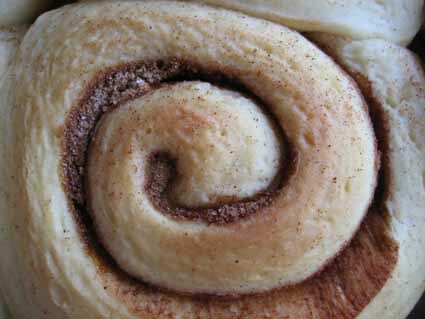 I made one batch of buns, half sticky and half cinnamon. 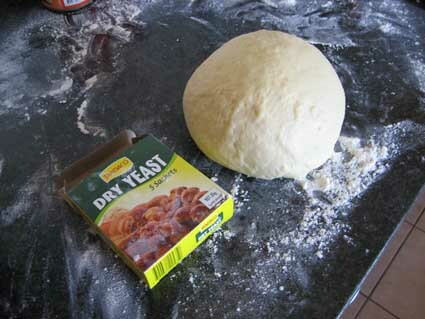 I used dried yeast, omitted the lemon and used sultanas (golden raisins) in place of raisins. 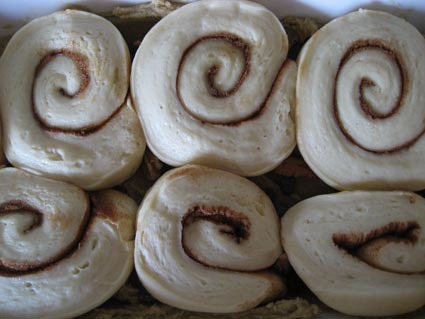 This recipe is not for the impatient as the buns need to be set aside for hours to rise. But if you have a spare half a day, they are well worth it. The recipe is fairly easy to follow; I had no real troubles. Some of the caramel sauce did escape from the pan while baking and decorated the bottom of my oven, so next time I will make smaller buns in a larger pan. Perhaps next time I will use less caramel sauce as it is VERY sweet. 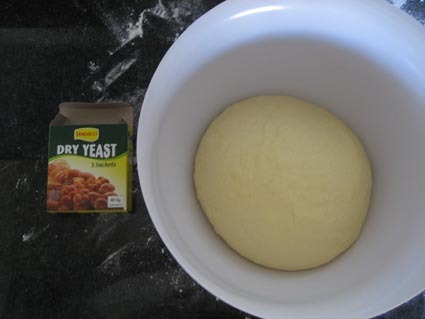 The dough before putting it aside to rise. Two hours later, yep that looks about double. 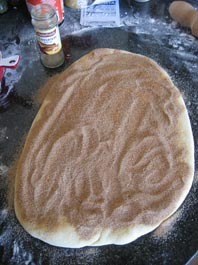 Dough rolled out, sprinkled heavily with cinnamon-sugar mix. 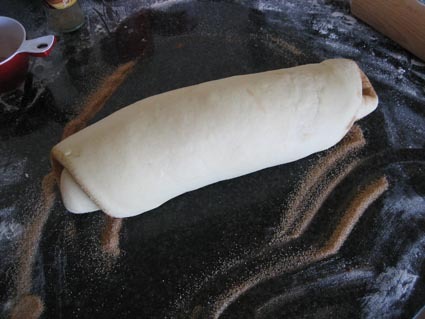 Dough rolled up and ready to cut. Caramel sauce sprinkled with raisins and pecans. 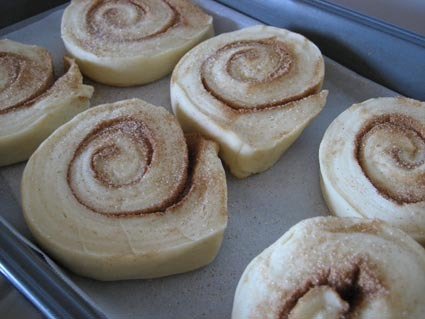 The cinnamon buns cut and ready to rise. The buns are ready to cook 90 minutes later. Bun fresh out of the oven! 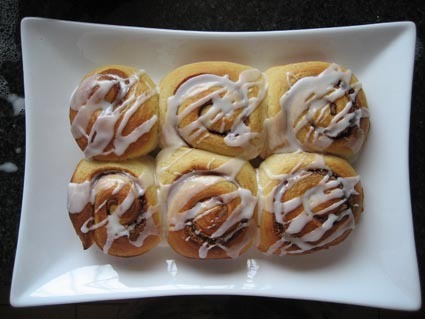 Cinnamon buns iced and ready to serve.